Objective: To determine the effectiveness of exercise as an intervention in the management of depression. Design: Systematic review and meta-regression analysis of randomised controlled trials obtained from five electronic databases (Medline, Embase, Sports Discus, PsycLIT, Cochrane Library) and through contact with experts in the field, bibliographic searches, and hand searches of recent copies of relevant journals. Main outcome measures: Standardised mean difference in effect size and weighted mean difference in Beck depression inventory score between exercise and no treatment and between exercise and cognitive therapy. Results: All of the 14 studies analysed had important methodological weaknesses; randomisation was adequately concealed in only three studies, intention to treat analysis was undertaken in only two, and assessment of outcome was blinded in only one. The participants in most studies were community volunteers, and diagnosis was determined by their score on the Beck depression inventory. When compared with no treatment, exercise reduced symptoms of depression (standardised mean difference in effect size −1.1 (95% confidence interval −1.5 to −0.6); weighted mean difference in Beck depression inventory −7.3 (−10.0 to −4.6)). The effect size was significantly greater in those trials with shorter follow up and in two trials reported only as conference abstracts. The effect of exercise was similar to that of cognitive therapy (standardised mean difference −0.3 (95% confidence interval −0.7 to 0.1)). Conclusions: The effectiveness of exercise in reducing symptoms of depression cannot be determined because of a lack of good quality research on clinical populations with adequate follow up. Depression is a common and important cause of morbidity and mortality worldwide. Although effective pharmacological interventions are available, much depression remains inadequately treated. Compliance with antidepressant treatment is often poor: studies have shown that between 20% and 59% of patients in primary care stop taking antidepressants within three weeks of the drugs being prescribed. 1 2 The effect of exercise on depression has been the subject of research for several decades, and the literature on the subject is growing.3 In the past decade “exercise on prescription” schemes have become popular in primary care in the United Kingdom,4 many of which include depression as a referral criterion. Three meta-analyses have looked at the effect of exercise on depression, and all found a benefit.9–11 However, these analyses pooled data from a range of study types that included uncontrolled studies and randomised as well as non-randomised controlled trials. They also pooled data from trials that compared exercise and no treatment with data from trials that compared exercise and other forms of treatment, and they did not explicitly assess the quality of the studies. Other studies have been completed since the most recent of these meta-analyses was published. This review summarises the evidence from randomised controlled trials of the effectiveness of exercise as a treatment for depression. We searched Medline (1966–99), Embase (1980–99), Sports Discus (1975–99), PsycLIT (1981–99), the Cochrane Controlled Trials Register, and the Cochrane Database of Systematic Reviews using the terms “exercise,” “physical activity,” “physical fitness,” “walking,” “jogging,” “running,” “cycling,” “swimming,” “depression,” “depressive disorder,” and “dysthymia.” We also examined bibliographies, contacted experts, and hand searched copies published in the 12 months to December 1999 of the following journals: BMJ, JAMA, Archives of Internal Medicine, New England Journal of Medicine, Journal of the Royal Society of Medicine, Comprehensive Psychiatry, British Journal of Psychiatry, Acta Psychiatrica Scandanavica, and British Journal of Sports Medicine. Three people independently reviewed titles and available abstracts to retrieve potentially relevant studies; studies needed to be identified by only one person to be retrieved. Studies were included in the review if the participants were diagnosed as having depression (by any method of diagnosis and with any severity of depression) and were aged 18 or above (with no upper age limit). Only randomised controlled trials were included. A trial was defined as a randomised controlled trial if the allocation of participants to treatment and comparison groups was described as randomised (including terms such as “randomly,” “random,” and “randomisation”). Studies had to include depression as an outcome measure and could be in any language. We excluded studies that compared different types of exercise, those that measured outcomes immediately before and after a single exercise session, and those that looked at the effect of exercise on anxiety or other neurotic disorders. We included studies that compared exercise and other, established treatments for depression. We assessed the quality of studies by noting whether allocation was concealed and intention to treat analysis was undertaken, and whether there was blinding. 12 13 For concealment of allocation we distinguished between trials that were adequately concealed (central randomisation at a site remote from the study; computerised allocation in which records are in a locked, unreadable file that can be accessed only after entering patient details; the drawing of sealed and opaque sequentially numbered envelopes), inadequately concealed (open list or tables of random numbers; open computer systems; drawing of non-opaque envelopes), and unclear (no information in report, and the authors either did not respond to requests for information or were unable to provide information). We defined trials as using intention to treat analysis if all the patients were analysed in the groups to which they were randomly allocated. If only those who started treatment or only those who completed treatment were included in the analysis we defined the study as not using intention to treat analysis. For blinding we distinguished between trials in which the main outcome was measured by an assessor who was blind to treatment allocation and those in which the main outcome was measured either by the participants themselves or by a non-blinded assessor. The two authors independently extracted data (the quality criteria, participant details, intervention details, outcome measures, baseline and post-intervention results, and main conclusions), using a structured form. We resolved discrepancies by referring to the original papers and discussion. We found current contact details of all authors through correspondence addresses on study reports and by searching websites. We contacted all authors by email or post (sending three reminders to non-responders), to establish missing details in the methods and results sections of the written reports and to determine authors' knowledge of or involvement in any current work in the area. On the envelopes we put return address details and a request to inform us if the addressee was no longer at that address. The studies used a number of psychometric instruments to assess depression, with several using more than one instrument. To include data from as many trials as possible we calculated effect sizes for each trial, using Cohen's method,14 and a standardised mean difference for the overall effect. To calculate a trial's effect size we defined the main outcome measure of depression as the one reported in the abstract or the first one reported in either the methods or results sections. As the main outcome measure in 10 of the 14 trials that were finally included was the Beck depression inventory, we also combined data from these trials to calculate the weighted mean difference in the Beck depression inventory score. We undertook a narrative review of all studies and a meta-regression analysis of those studies with appropriate data. The effect of exercise compared with “no treatment” (controls on a waiting list; placebo intervention; or, where exercise was an adjunct, with both treatment and control groups receiving an identical established treatment) was considered separately from the effect of exercise compared with an established treatment for depression. Some studies were included in both analyses as they contained exercise, established treatment, and control groups. We anticipated that systematic differences between studies (heterogeneity) would be likely. This was the case for the meta-analysis of studies comparing exercise with no treatment; for these we used a random effects model based on DerSimonian and Laird's method to calculate the pooled effect size.15 The results of studies comparing exercise with cognitive therapy were homogeneous; for meta-analysis of these we used the fixed effects inverse variance method.16 We also undertook a meta-regression analysis to assess the effects of allocation concealment, intention to treat analysis, blinding, the setting (whether participants were volunteers from the community or clinical patients), baseline severity of depression (using Beck depression inventory scores or, for the two studies that did not report baseline Beck depression inventory scores for the whole study sample, inputting the mean of these scores), type of exercise (aerobic or non-aerobic), type of publication (peer reviewed journal, conference abstract, or doctoral dissertation), and length of follow up. We used STATA (version 6) statistical software for all the analyses. Sixteen articles reporting 14 studies fulfilled the inclusion criteria.73–88 Of these 14 studies, 10 were in the United States, 73 74 79–81 84–88 two were in the United Kingdom, 75 78 and one each were in Canada77 and Norway.82 Eight of the 14 studies compared an exercise group with a no treatment group, 74 75 77–79 82 and six compared exercise directly with an established form of therapy: four with cognitive therapy, 80 81 84 87 one with psychotherapy,88 and one with antidepressant treatment.73 Three of these also had a no treatment group 81 84 87; thus in total 11 studies compared exercise with no treatment and six compared it with an established treatment (fig 1). Authors of 11 of the 14 studies responded to our request to provide missing data, 73–78 80 82–86 88 but three were unable to provide all the information. 85 86 88 Only seven of the 14 written reports provided adequate data for statistical pooling and confirmation of study conclusions. Through contact with authors we were able to obtain adequate data for a further five. Most studies were of poor quality. In no study was treatment allocation described, and contact with authors established that allocation might have been adequately concealed in only three studies. 74 75 82 Intention to treat analysis was undertaken in two studies. 73 74 The main outcome was measured by the participants themselves, by means of a questionnaire, in all but two of the studies. 73 75 The outcome assessor in one of these exceptions was not blinded,75 therefore assessment of outcome was blind in only one of the 14 studies. Table 1 summarises the 11 studies that compared exercise with no treatment, 10 of which had data available for analysis. The pooled standardised mean difference in effect size, calculated using the random effects model, was −1.1 (95% confidence interval −1.5 to −0.6). Significant heterogeneity between studies (Q=35.0, P<0.001) was not associated with allocation concealment, intention to treat analysis, blinding, setting, baseline severity of depression, or exercise type but was associated with type of publication and length of follow up. The reported effect of treatment was significantly higher in conference abstracts than in peer reviewed journals or doctoral dissertations (P<0.01). The estimated variance (τ2) between studies was reduced from 0.41 to 0.03 when “abstract” was added as a variable to the model. Length of follow up was significantly negatively associated with the size of effect: the addition of the variable “follow up” reduced τ2 from 0.41 to 0.08. When both these variables were combined in the model, τ2 was reduced to zero. 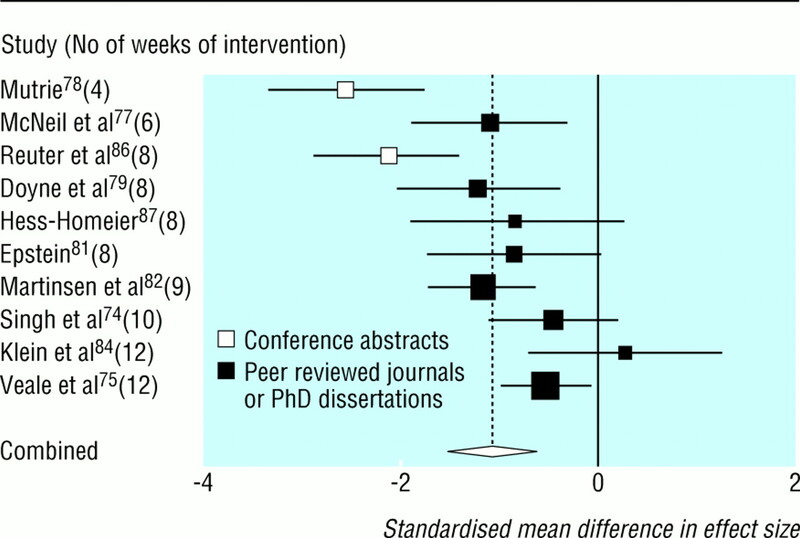 Figure 2 shows the standardised mean differences in effect size of the 10 studies that provided these data, with the studies listed in order of length of intervention. Pooling studies according to type of publication gave standardised mean differences, calculated using the fixed effects model, of −0.7 (−1.0 to −0.5; n=8) for journal papers and dissertations and −2.3 (−2.9 to −1.8; n=2) for conference abstracts; pooling according to duration of intervention gave −1.8 (−2.3 to −1.3; n=2) for less than eight weeks, −1.3 (−1.8 to −0.9; n=4) for eight weeks, and −0.6 (−0.9 to −0.3; n=4) for more than eight weeks (there was no significant heterogeneity within these subgroups). Although the effect size remained significant when the two conference abstracts were excluded and when we analysed only those studies of more than eight weeks' duration, the effect was reduced. Pooling the nine studies that used the Beck depression inventory as a measure of depression gave a weighted mean difference in the score of −7.3 (−10.0 to −4.6). Again there was significant heterogeneity, associated with type of publication and length of follow up. Table 2 summarises the six studies that compared exercise and standard interventions, four of which compared exercise and cognitive therapy. 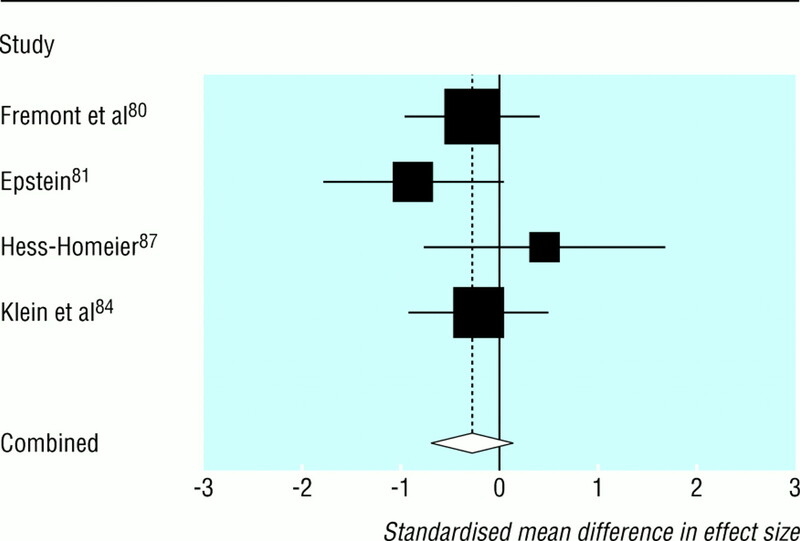 Figure 3, which shows the standardised mean differences of these four studies, shows that the difference in effect size between exercise and cognitive therapy was not significant (standardised mean difference −0.3 (95% confidence interval −0.7 to 0.1)). These studies were homogeneous (Q=2.9, P=0.4). Only one study compared exercise and standard antidepressant treatment.73 Its main outcome measure—the Hamilton rating scale of depression—did not differ significantly between the groups of patients receiving the exercise intervention, medication, or both; and at the end of the intervention period the proportion of patients diagnosed as no longer depressed was similar in each group. Exercise may be efficacious in reducing depressive symptoms, but the poor quality of much of the evidence is of concern. The fact that none of the measures of study quality explained the variation among the studies is likely to be due to the low quality of most of the studies. The size of the effect is increased by results from two unpublished conference abstracts and studies with a shorter follow up period, suggesting that results may be sustained only in the short term. All the studies reported results at the end of the intervention, and only one study followed patients up beyond the completion of the intervention. This was the only study that found no effect of exercise, compared with the control group, at the end of the intervention period (12 weeks); at nine months' follow up the reduction in symptoms remained similar in the exercise intervention, control (meditation), and cognitive therapy groups.84 Thus this evidence does not support a sustained effect of exercise beyond the intervention period. Participants from one other study are being followed up for two years (N Singh, personal communication, 1999),74 and the results of this follow up will provide important information. The size of the effect of exercise compared with no treatment in the studies we analysed is similar to those found by three previous meta-analyses.9–11 We aimed to provide a better quality analysis by including only trials that were described as randomised controlled trials. Our results did not differ from those of meta-analyses that also included non-randomised trials and observational data; this may be because the effect of randomisation was mitigated by the lack of adequate concealment, intention to treat analysis, and blinding, making the trials in our analysis no better than non-randomised trials. Our aim was to assess clinical effectiveness—that is, the likely effect of exercise on clinical patients in everyday practice. Although no trial can exactly replicate everyday practice, the screening out of individuals who were not motivated to exercise, the use of non-clinical volunteers, and the lack of intention to treat analysis in most of the studies suggest that our results overestimate what would be likely in real life. In the United Kingdom rates of compliance with “exercise on prescription” schemes among patients with any referral criteria vary from 20% to 50%. 4 89 It is reasonable to assume that compliance among patients with depression would be similar or worse. Salmon has pointed out that the allocation of depressed patients in these studies to activities such as running or aerobics “must puzzle clinicians, who in treating depressed people, often have to contend with an absence of motivation to tackle much less strenuous features of life's routine.”37 Baseline severity of depression, when added to the regression model, was not associated with any of the systematic differences between studies. This suggests that, although different criteria for determining inclusion were used, participants in each study had similar levels of depression. However, the fact that most studies used non-clinical participants means that the results may be less generalisable. To use as much of the available data as possible we calculated the standardised mean difference using effect sizes. The result is therefore expressed as a standard deviation. That is to say, our results show that people who exercise are “1.1 standard deviations less depressed than non-exercisers”; in clinical terms such a result is difficult to understand. We also calculated pooled differences in the mean score on the Beck depression inventory (a common instrument in mental health research) for those studies in which this measure was used. We argue, however, that even such a well known instrument is difficult to interpret clinically. Our result shows that people who exercise score less on the Beck depression inventory scale (by 7.3 points) than those who do not exercise, a result that is likely to have little meaning for most doctors and patients. A more useful outcome measure would be the likelihood of being depressed after the intervention, but only two studies included a dichotomous outcome. 73 81 Epstein, comparing exercise and no treatment, found no significant difference between the exercise and control groups in the numbers of participants who were still diagnosed as having depression.81 A dichotomous result is a more understandable and perhaps a more important outcome measure in clinical terms, and such measures should be included in future research in this area. Many of the problems we identified in the studies we reviewed are also present in research into other interventions in the management of depression, 90 91 highlighting the need for better quality research in the area of depression. We conclude that it is not possible to determine from the available evidence the effectiveness of exercise in the management of depression. However, exercise may be efficacious in reducing the symptoms of depression in some volunteers in the short term. Doctors could recommend more physical activity to their motivated patients, but this should not replace standard treatment, particularly for those with severe disease. Other health benefits could accrue to patients who do become more active. 92 93 There is a need for well designed, randomised controlled trials on a clinical population that measure both continuous and dichotomous outcomes and that follow up participants for at least 12 months. This work began as part of a training course at the NHS Centre for Reviews and Dissemination, University of York, and we thank Jos Kleinan and other staff at the centre for their help. Alan Lui (audit nurse, Airedale General Hospital, West Yorkshire) helped with the protocol development and retrieval of articles. Domenico Scala (senior house officer, psychiatry, Lynfield Mount Hospital, Bradford) translated one Italian paper. Matthias Egger and David Gunnell (department of social medicine, University of Bristol) gave useful comments on an earlier draft. Contributors: Both authors developed the idea for the review, the protocol, and the search strategy, applied the search strategy, and independently extracted data from retrieved articles. DAL undertook all statistical analyses and wrote the original draft of the paper. Both authors contributed to the final version of the paper, and both act as guarantors. .The treatment of depression in general practice: a comparison of L-tryptophan, amitriptyline and a combination of L-tryptophan and amitriptyline with placebo.Psychol Med1982; 12:741–751. .Treatment of depression in general practice.BMJ1973; ii:18–20. .The contributions of physical activity to psychological development.Res Q1960; 31:307–320. .Physical activity in primary care in England.London:Health Education Authority,1994. .Expressive writing moderates the relation between intrusive thoughts and depressive symptoms.J Pers Soc Psychol1997; 73:1030–1037. .Randomised controlled trial of problem solving treatment, antidepressant medication, and combined treatment for major depression in primary care.BMJ2000; 320:26–30. .Foundations of exercise and mental health.Morgantown, WV:Fitness Information Technology,1994:17–44. .Endorphins and exercise: physiological mechanisms and clinical implications.Med Sci Sports Exerc1990; 22:417–428. .Effect of exercise on depression.Exerc Sports Sci Rev1990; 80:379–416. .The effects of exercise on depression: a review and meta-regression analysis [dissertation]. In: Milwaukee:University of Wisconsin,1991. .The effects of exercise on clinical depression and depression resulting from mental illness: a meta-regression analysis.J Sport Exerc Psychol1998; 20:339–357. .Improving the quality of reports of meta-analyses of randomised controlled trials: the QUOROM statement.Lancet1999; 354:1896–1900. .Empirical evidence of bias. Dimensions of methodological quality associated with estimates of treatment effects in controlled trials.JAMA1995; 273:408–412. .Parametric measures of effect size. In: Cooper H, Hedges LV, eds. The handbook of research synthesis.New York:Russell Sage Foundation,1994. .Meta-regression analysis in clinical trials.Control Clin Trials1986; 7:177–188. .A comparison of statistical methods for combining events rates from clinical trials.Stat Med1989; 8:141–151. .Sport and depression therapy.Int J Sport Psychol1982; 13:187–193. .Exercise and psychosocial health.Res Q Exerc Sport1995; 66:292–297. .Exercise and the treatment of depression.Br J Hosp Med1989; 42:267. .The efficacy of physical activity interventions within mental health services: anxiety and depressive disorders.J Ment Health1997; 6:543–566. .The effect of exercise on depression, anxiety and other mood states: a review.J Psychosom Res1993; 37:565–574. .Exercise and mental health.Acta Psychiatr Scand1987; 76:113–120. .Physical activity and public health: mental health.Quest1995; 47:362–385. .Exercise and mental health: a review.J R Soc Health1996; 116:7–13. .Exercise and sport in mental health: a review of the literature.Isr J Psychiatry Related Sci1990; 27:99–112. .Exercise as a treatment option for anxiety and depressive disorders.Milit Med1987; 152:299–302. .Aerobic exercise and mood.Sports Med1992; 13:160–170. .Exercise intervention studies in patients with anxiety and depressive disorders [abstract]. In: Proceedings of sport, health psychology and exercise symposium.London:Sports Council and Health Education Authority,1988:77–83. .Therapeutic implications of exercise for clinically anxious and depressed patients.Int J Sport Psychol1993; 24:185–199. .The role of aerobic exercise in the treatment of depression.Stress Med1987; 3:93–100. .Physical activity and depression: clinical experience.Acta Psychiatr Scand1994; 377(suppl):23–7S. .Exercise training as an alternative treatment for depression among older adults.Altern Ther Health Med1998; 4:48–56. .Physical activity and psychopathological variables.Analytic Psychother Psychopathology1991; 10:163–168. .Getting physical: does exercise help in the treatment of psychiatric disorders?J Psychos Nurs Ment Health Serv1996; 34:39–43. .Exercise and mental health. Beneficial and detrimental effects.Sports Med1990; 9:323–329. .Psychiatric benefits of physical exercise.Br J Hosp Med1990; 43:107. .Running therapy for the depressed client.Top Clin Nurs1981; 3:77–86. .Exercise and running: effects on anxiety, depression and psychology.Humanistic Education Dev1982; 21:51–57. .Physical exercise and psychological well being: a critical review.Br J Sports Med1998; 32:111–120. 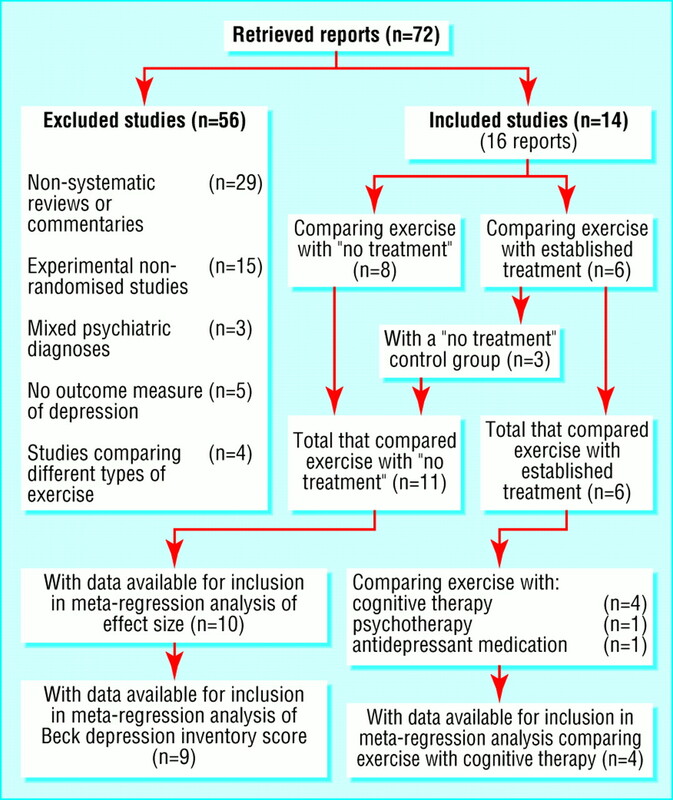 .Exercise as a treatment for depression: an update.Clin Psychol Rev1985; 5:553–568. .The psychological benefits of exercise.Med Health R I1997; 80:295–296. .Psychomotor therapy in depressive patients.Issues Special Education Rehabil1993; 8:29–34. .Running as treatment for depression: is it worth it?J Sport Psych1983; 5:288–301. .Physical exercise and psychological health.Sports Med1994; 17:108–116. .Weight lifting therapy: a preliminary report.Psychosoc Rehabil J1994; 18:99–102. .Aerobic running as a treatment for moderate depression.Percept Motor Skills1979; 48:228. .The value of exercise on a psychiatric hospital unit.Hosp Community1982; 33:641–645. .The relative efficacy of structured reminiscence and physical exercise on clinically depressed geriatric inpatients [dissertation]. In: Hempstead, NY:Hofstra University,1990. .Aerobic exercise as a treatment for depression in women.Behav Ther1983; 14:434–440. .Effects of running on depressed adults.Am Ment Health Counselors Assoc J1983; 5:75–84. .Effect of aerobic conditioning upon mood in clinically depressed men and women: a preliminary investigation.Percept Motor Skills1982; 55:1217–1218. .The effect of a jogging program on psychiatric inpatients with symptoms of depression.Occup Ther J Res1983; 3:173–175. .Aerobic exercise in the treatment of nonpsychotic mental disorders: an exploratory study.Nord Psykiatr Tidsskr1989; 43:521–529. .The role of exercise training in aged subjects with anxiety-depression syndrome.Arch Gerontol Geriatr1998; 6(suppl):381–34S. .Reducing symptoms of depression with exercise [letter].Psychosomatics1990; 31:112–113. .Responses to activation and rest in patients with panic disorder and major depression.Br J Clin Psychol1996; 35:605–616. .Movement therapy with depressed inpatients: a randomised multiple single case design.Arch Psychiatr Nurs1994; 8:22–29. .Effect of levels of exercise on psychological mood states, physical fitness and plasma beta-endorphin.Percept Mot Skills1986; 63:1099–1105. .Psychophysiological effects of a running program on depression and anxiety in a psychiatric population.Psychological Record1988; 38:37–48. .The effect of supervised physical activity on cognitive and affective state of geriatric and psychogeriatric in-patients.Clin Gerontol1994; 15:47–56. .The effects of exercise therapy on clients in a psychiatric rehabilitation program.Psychosoc Rehabil J1993; 16:75–83. .The effects of an aerobic exercise programme on psychological variables in older adults.Int J Aging Hum Dev1985; 20:1984–1985. .Influence of aerobic exercise training and relaxation training on physical and psychological health following stressful life events.Psychosom Med1987; 49:355–365. .Long term effects of aerobic exercise on psychological outcomes.Prev Med1999; 28:75–85. .Psychological and cognitive effects of an exercise program for community-residing older adults.Gerontologist1990; 30:184–188. .Perceived change among participants in an exercise program for older adults.Gerontologist1990; 30:516–521. .Running and mixed physical exercises with depressed psychiatric patients.Int J Sport Psychol1993; 24:170–184. .Comparing aerobic and non-aerobic forms of exercise in the treatment of clinical depression: a randomised trial [abstract]. In: Proceedings of sport, health psychology and exercise symposium.London:Sports Council and Health Education Authority,1988:84–95. .Comparing aerobic with nonaerobic forms of exercise in the treatment of clinical depression: a randomised trial.Compr Psychiatry1989; 30:324–331. .Exercise intensity and reduction in neurotic symptoms.Acta Psychiatr Scand1989; 80:231–235. .Effects of exercise training on older patients with major depression.Arch Intern Med1999; 159:2349–2356. .A randomized controlled trial of progressive resistance training in depressed elders.J Gerontol A Biol Sci Med Sci1997; 52(1):M27–M35. .Aerobic exercise in the adjunctive treatment of depression: a randomised controlled trial.J R Soc Med1992; 85:541–544. .Aerobic exercise in the adjunctive treatment of depression: a randomised controlled trial [abstract]. In: Proceedings of sport, health psychology and exercise symposium.London:Sports Council and Health Education Authority,1988:106–111. .The effect of exercise on depressive symptoms in the moderately depressed elderly.Psychol Aging1991; 6:487–488. .Exercise as a treatment for moderate depression in the UK National Health Service[abstract]. In: Proceedings of sport, health psychology and exercise symposium.London:Sports Council and Health Education Authority,1988:96–105. .Running versus weight lifting in the treatment of depression.J Consult Clin Psychol1987; 55:748–754. .Aerobic exercise and cognitive therapy in the treatment of dysphoric moods.Cognitive Ther Res1987; 11:241–251. .Aerobic activity versus group cognitive therapy: an evaluative study of contrasting interventions for the alleviation of clinical depression [dissertation]. In: Reno:University of Nevada,1986. .Effects of aerobic exercise on depression: a controlled study.BMJ1985; 291:109. .Adherence to exercise and patients' evaluation of physical exercise in a comprehensive treatment programme for depression.Nord Psykiatr Tidsskr1989; 43:411–415. .A comparative outcome study of group psychotherapy vs. exercise treatments for depression.Int J Ment Health1985; 13:148–177. .Influence of aerobic exercise on depression.J Pers Social Psychol1984; 46:1142–1147. .Running as an adjunct to counseling in the treatment of depression [dissertation]. In: Pennsylvania:Pennsylvania State University,1984. .A comparison of Beck's cognitive therapy and jogging as treatments for depression [dissertation]. In: Missoula:University of Montana,1981. .Running as treatment for depression.Compr Psychiatry1979; 20:41–54. .Physical activity promotion through primary health care in England.Br J Gen Pract1997; 47:367–369. .Putting trials on trial—the costs and consequences of small trials in depression: a systematic review of methodology.J Epidemiol Community Health1997; 51:354–358. .The adequacy of reporting randomized controlled trials in the evaluation of antidepressants.Can J Psychiatry1998; 43:1026–1030. .Benefits of exercise in health and disease.BMJ1994; 308:1291–1295. .A meta-regression analysis of physical activity in the prevention of coronary heart disease.Am J Epidemiol1990; 132:612–628.